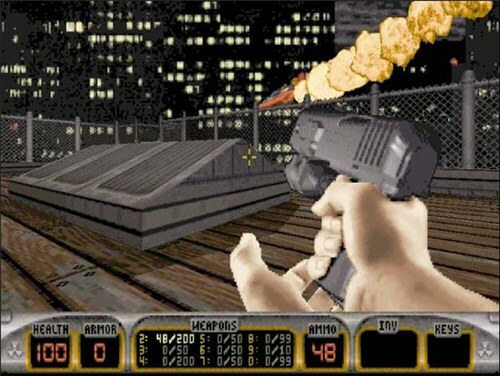 Duke Nukem: Total Meltdown is a first-person shooter that was released simply as Duke Nukem in Europe. Your job is to annihilate the aliens and foil their plans to destroy Earth. There's four episodes and the objective in each level is to collect key cards to unlock doors and reach the exit. At your disposal is an extensive range of weapons (such as a Shotgun and RPGs), as well as a robust inventory that includes a Jetpack and Scuba Gear. Unfortunately none of the control schemes are comfortable and the frame-rate is terrible. The action is faster than the Sega Saturn version (1997), but the game engine can't keep up meaning there's a slight delay until the screen refreshes; the graphics are also much darker with a reduced draw distance. At least the level design is good and the L.A. Meltdown episode features memorable battles in an adult cinema and Death Row. The Abyss canyon level is a confusing mess though due to the lack of signposting and weak platforming. The Lunar Apocalypse episode fares better and the futuristic theme reminds me of Perfect Dark (2000, N64). Shrapnel City is perhaps the best episode in the game, taking in varied locations such as a Bank, Movie Set, Subway and Hotel. Unfortunately it includes another canyon level which is a pain to navigate. The exclusive Plug 'N' Pray episode has a cool Wipeout (1995, PS1) inspired level but the rest is horrid with a frame-rate that can dip into single digits! As a whole, the gameplay shines when it sticks to straight-up shooting and exploring; where it falters is when it throws in gimmicky abilities such as the fiddly Jet Pack and Scuba Gear. There's lots of trial and error too but the Quick Save option is a real blessing to lower any frustration. Duke Nukem: Total Meltdown is a good first-person shooter but it's hard to recommend this port over the Sega Saturn one due to the severe technical issues that affect the majority of the game. Unless you're a die-hard Duke fan wanting to see the (lacklustre) exclusive content there's little to recommend in this version. Random trivia: This version features some new music tracks and various rearrangements of existing songs.